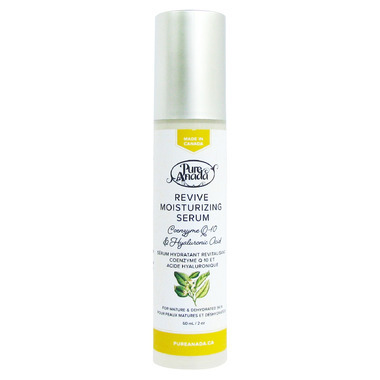 Pure Anada Revive Moisturizing Serum is great for mature and aging skin. A luxurious anti-aging serum formulated with intense Co-Enzyme Q-10 anti-oxidants and cell plumping Hyaluronic Acid. Olivem®1000 Crystal SkinTechnology combined with lightweight, organic Sunflower Oil and fresh citrus hydrosols deliver a deep tissue, hydrating and firming treatment. This treatment has a Lemon (Lemongrass hydrosol) scent. This moisturizer is superb!! It's very hydrating, and gives my skin a wonderful glow. I tried a whole bunch of natural products, but this one beats them all! This has a lovely lemongrass smell and is easy to use. It absorbed easily into my skin and layered nicely with the moisturizer I used. Thank you, Pure Anada! This product is so nice on my skin. I appreciate that it's Canadian, all natural and no coconut as I can't use and so many natural products contain it now! Pure Anada is a brand I trust. Never disappointed. This serum works great. Bought several times already. C'est un produit que j'apprÃ©cie, belle texture, sent un peu fort au dÃ©but, mais s'attÃ©nue trÃ¨s vite, cependant c'est moins hydratant que je l'espÃ©rais. The cream leaves my skin soft and tight. I love it ! This skin cream is absolutely amazing!! Having a gluten allergy had really affected my skin. It was dry and always red and sore around the eyes. After one week of switching to the Pure Anada line of skin care the dryness and redness were gone, but best of all so were all the fine lines! I am 41 and people constantly assume I am in my late 20's. I love this stuff!! Soaks in beautifully and non-greasy. My skin feels well hydrated all day. Lovely scent, but not at all irritating for my sensitive skin. Highly recommended. Nice citrus-y scent, soaks right into my skin and feels dewy. I have very sensitive eyes to some facial products but this one doesn't bother me at all. Would recommend. This is the 2nd order of Pure Anada Revive Anti-Aging Treatment. I like the texture, smell and how it absorbs into my skin. I found an improvement.